0515 rolls around pretty quickly on the morning of a big ride–imagine how quickly it came the morning of the biggest ride we have done! Many riders suffer from what we call “pre-ride jitters”. These are a series of anxious thoughts, jumbled together with some gastric juices and moments of panic–Do I have enough supplies packed? Did I forget anything? Where are my electrolytes? Is my horse going to be able to do this? Can I do this? Some people will take sleep aids; others, like myself, try to shut our minds down and just sleep as best we can. Riding distance is just as much a mental game as it is physical–perhaps more so. We can create self-fulfilling prophecies, whether they be good or bad. Our own tension and doubt will be readily picked up by our equine partners–these beings are most sensitive to our inner thoughts. Likewise, positive thoughts and good mental imagery can help you make your way down the trail. A mind set on a goal can help a person push past the tedious steps of the now for the big reward at the end of the road; distance riding revolves around this. Four years ago, I was laying on the ground of the round pen, all wind knocked out of my sails. My oldest daughter, then 2, asked me in her limited vocabulary, “mama fall off? mama fall down?” I grunted back “yeeeahh”. Priscilla, my friend and business partner in Prairie Sylvania Arabians, came and got the young horse out of the pen and put her away. I laid on the ground and wiggled my toes and fingers. Check. All systems a go. I log-rolled myself onto my left side and tried to sit up. Mayday! We have a problem! The sharp burning pain in my midback made me catch my breath and I laid myself back down. I cursed myself–I should know better. I’m a nurse anesthetist. You don’t move someone if they’ve possibly had a spine injury. Possibly injured was not in the operative range here–when I flipped over the horse’s head, I landed on my helmeted head first, hit the base of my neck and then back…by the time I finished the roll, I was almost standing again. I immediately laid myself back down, thinking there was a great likelihood that I had injured something. We decided to call the ambulance, and as I waited I was actually quite comfortable, considering the ground was so hard. I do have to say that Tipperary helmets are very ergonomic for a state of horizontal downtime. CT scans at the small hospital I went to first read that I had T6 and T7 vertebral body fractures, along with a rib fracture at T7. I was shipped into Wichita, a larger town with a more advanced hospital with spine specialists on call. I was assigned a brace for 2 months, a weight lifting limit of 15 pounds and fortunately got to forego surgery. It’s amazing how much you don’t realize you’re using your spine until it’s injured–these events occurred on a Thursday afternoon–I went back to work on Tuesday. I don’t think the bones created much pain, but the muscles…whole different story. I did my best to follow doctor’s orders, but occasionally your reflexes kick in. My daughter slipped and I went to catch her–agonizing! The week after I restarted work, I had a terrible airway to manage–it took my breath away. My downtime at home was spent laying on the couch. I felt as though I was at the lowest point of my life–I could barely do housework, I could barely take care of myself, let alone my toddler daughter. I could hardly even fix my hair. I felt downright helpless. I could have just wallowed in the misery. Instead, however, I tried to make a positive out of it by studying training videos. I spent every waking moment (and asleep moments, since the couch was my new home) watching Clinton Anderson’s Fundamentals. In my eyes, I watched the step by step making of a respectful horse–in my mind, I watched step by step the accident replaying. I learned a lot in the recovery period, and picked out a lot of areas in which I had made mistakes; I vowed I would learn as best I could, because I planned on riding again. The start of the ride took us down a winding gravel mountain road. It seemed to go on forever. 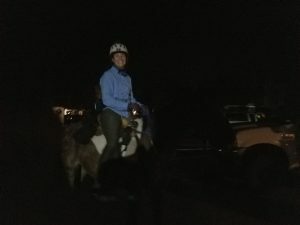 I pulled myself off of the pack that seemed to be going at an ever increasing pace–most riders I believe were trying to make up time for the 2 mile controlled start that we were required to walk. 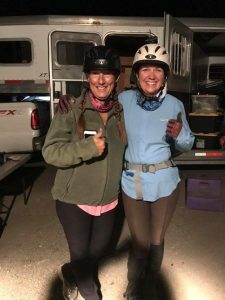 Several people who were wiser and more experienced at distance riding than I am told me to take things slow at the beginning and just get through the trail–it was supposed to be pretty difficult terrain and there was no sense in injuring my horse or overdoing things too early. The day before the ride started, I took my mileage chart and calculated what times I should be at cutoffs to maintain an adequate speed to make the cutoff times. I did plan to go a little faster, maybe 6-6.5 mph up front, to help give me a little cushion in case anything should block me down the trail. Still, I pulled back from the people ahead of me and was even passed by quite a few. Rio was used to me doing this kind of pacing and seemed to pay no heed to the others disappearing from our sight. My goal was McCann Stadium–I did my best to not let the emotion and the energy of the other horses and riders sweep us away from our plan. I didn’t want to burn my mare out of energy ahead of the game–we had a long way to go to reach that goal. 100 miles, to be exact. The suspense is killing me! Is there more to come? Thanks Lisa!! I will be writing more! I have had a pretty busy schedule, but I’m hoping to get some more entries written soon and will post on FB!